The Red Sox haven't exactly been lucky in the health department this year. The outfield was so decimated by injuries that the Sox had to resort to undrafted prospects, beer vendors and your cousin Tawmmy. 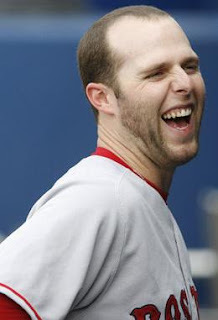 But they were able to make do because the heart and soul of the Sox, Dustin Pedroia, could will them to victory using only his scrapiness and clutchiness. Bad news swept over Boston last night like Black Death overtook Crimea in 1346. Dustin Pedroia broke his foot and might miss up to six weeks. Ahhhh. Everybody take cover under your school desk, the sky is falling. Don't worry Boston, I'm going to help you come up with some possible replacements while Pedroia rests at home in that tree where he bakes cookies in the offseason. Negatives: wore a Yankees hat, I can stop there right?